Erneut eine Erstbeschreibung. Die Splitter sind wieder unterwegs. Die komplette Erstbeschreibung finden Sie hier. We are nearing the beautiful Pinal Mountains in southeastern Arizona, nearing also the end of our journey over the broad expanse of the Arizona-California desert. After all it is one desert; California, Arizona – what are mere geographical lines or names in the desert land of plants and flowers, in that vast natural amphitheater of the great Southwest? Here in the long low rays of the afternoon sun we see at a distance the purple haze gathering over the mountain peaks, and we know that our day’s work is nearing completion with the coming of the beautiful sunset hour. 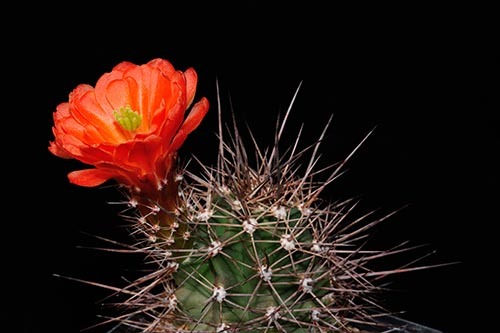 And here It is, four thousand feet up in the rocky foothills, that we espy the rare little beauty Echinocereus Bonkerae, named for Frances Bonker, one of the authors of this book. 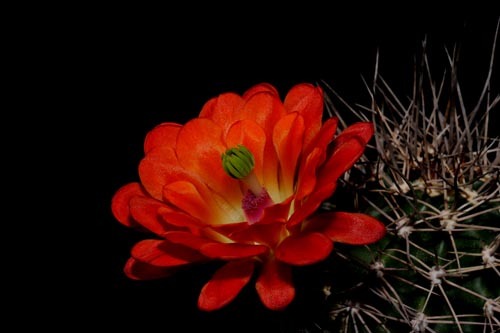 It Is a new Strawberry Cactus, growing In the foothills and low mountain ranges of southeastern Arizona, and was discovered only last year in the Pinal Mountains and also near Oracle, Arizona. It differs from all other species of its kind In that all the spines are very short, and its fruit is sweet and more nearly the size of a strawberry than any of the others; also the spines do not suggest the Hedgehog Cactus, so that the common name of Short Spined Strawberry Cactus is given to Bonkerae, as more nearly resembling a strawberry In its fruit than any other of the Strawberry Cactus clan. The juicy, luscious berries, less than an inch long, are delicious as jam or served cold with cream; they are always the first to appear in the spring. Often but two inches tall, sometimes reaching six or eight inches, this little Strawberry Cactus grows In clumps of two or three to ten stems which are densely ridged and tubercled. The flowers, nearly three inches long and about the same in width, are a deep rose-purple, and appear in April, the first of the purple-flowered species to bloom. It is easily recognized by Its many ridges and very short spines, all less than a half-inch long, which are whitish or yellowish when young and reddish brown when mature, and by its bright purple blossoms, borne well up on the stems, which open in the forenoon and close in late afternoon, lasting for several days. 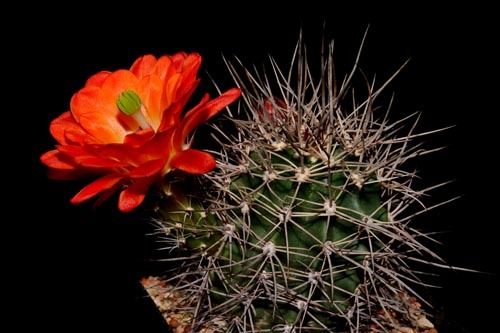 Bonkers, or the Short Spined Strawberry Cactus, is oblong-cylindrical with the tips somewhat depressed. It has low obtuse ridges, fewer than twenty, of a light green. These ridges are covered with a network of radial spines, the younger ones whitish, fading to gray-white, yellow or yellowish brown in age. The centrals are yellow-brown changing to red-brown in older thorns. All the spines are less than a half-Inch long and vary in coloring, with brown bulbous bases and translucent tips. This cactus is to be found in clusters of from two to ten stems, and is very attractive with its rose-purple to deep rose-purple flowers nearly three inches long, and its many stamens, stigmas, and filaments in bright and light green. The fourteen petals and nine sepals have obtuse tips and short points; the styles are longer than the stamens. Plants grow along the dry foothills and low mountains in clumps of a foot or less across. This species grows outdoors and is not Injured by temperatures twenty or twenty-five degrees below freezing; in colder climates than this it must be given some protection or grown in cool, dry, sunny greenhouses. Plants may be grown at any season in gravelly or sandy clay soils with light irrigation every two or three weeks to moisten the soil during the growing season or in droughty periods. Or they may be grown readily from seed sown in sandy loam in flats or pots, with partial shade and with enough water to keep the soil moist. The species is a handsome one for rock gardens, as yet little known. Mature specimens transplanted early in spring blossom the same season. Echinocercus polyacanthus, n. sp., elongato-ovatus, 10-costatus; areolis elevatis, ovatis, subapproximatis, junioribus albido 4-tomentosis; aculeis radialibus 10-12 flavidis, apice adustis, plus minus porrectis; lateralibus majoribus, demum subadpressis, superioribus minoribus; centralibus sub-4 corneis, apice fuscis, 3 superioribus sursum versis, inferiore singulo longiore porrecto, demum deflexo. Echinocereus adustus, n. sp., ovatus, 13-15-costatus; areolis elevatis, lanceolatis, approximatis, junioribus albo-tomentosis; aculeis radialibus 16-18 adpressis, albis, apice adustis; 4-5 superioribus brevibus, setaceis, lateralibus inferioribusquc longioribus, robustioribus, centrali nullo. Cosihuiriachi.—Plant 1.5 to 4 inches high, 1 to 2 in diameter; upper spines 1 , lower about 2, and lateral 4 to 5 lines long. Echinocereus dasyacanthus, n. sp. ovato-oblongus, s. subcylindricus, 17-18 costatus costis tuberculatis subinterruptis, areolis approximatis, ovato-lanceolatis, junioribus albo-villosis; aculeis albidis, junioribus apice rufidis radialibus sub-18 porrectis, summis brevioribus tenuioribus, lateralibus inferioribusque longioribus; centralibus 4-6 pluribus deflexis. El Paso del Norte. The specimen before me, one of the largest, is 12 high, and 3.5 inches below, and 2 inches above in diameter; wool on the young areolae unusually long, deciduous ; upper spines 3 lines long, lower lateral ones slightly compressed 6 to 7 lines long, lowest 5 lines long; central spines nearly as long as the last, stouter than the others. 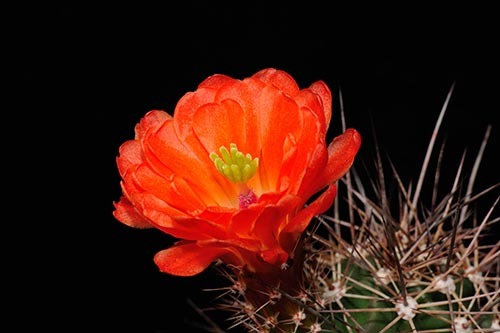 From E. pectinatus and E. caespitosus,* which it resembles, it is distinguished by the longer, not appressed spines, the larger number and size of the central spines, &c.
Echinocereus coccineus, n. sp. globoso ovatus, 9-11 costatus, costis tuberculosis subinterruptis; areolis ovatis junioribus albo-tomentosis; aculeis radialibus 9-10 albidis, rectis, oblique porrectis, superioribus brevioribus; centralibus 1-3 longioribus albidis s. corneis; floribus lateralibus; tubo pulvillis 18-25 albo-tomentosis, setas tenues albidas 8-11 gerentibus stipato; sepalis interioribus 8-10 oblongo linearibus obtusis; petalis 10-12 obovatis obtusis; staminibus brevioribus; stigmatibus 6-8 virescentibus. much those of the last species, but the plant is very different. Echinocereus triglochidiatus, n. sp. ovato-cylindricus, 6-7 costatus, costis undulatis, acutis; areolis sparsis, orbicularis, junioribus albo-lanatis; aculeis 3-6, plerumque 3, rectis compressis angulatis, cinereis, sub-deflexis; noribus lateralibus, tubo pulvillis 15-20 albo-tomentosis setas spinosas apice fuscas 2-5 gerentibus stipato; sepalis interioribus sub-12 oblongolinearibus obtusis; petalis 12-15 obovatis obtusis; staminibus petala subaequantibus; stigmatibus 8-10 virescentibus. On Wolf creek, in pine woods, flowers in June; Santa Fe (Fendler) 4 to 6 inches high, 2 to 2.5 in diameter; spines in young specimens 4 to 6, in older ones generally 3, two lateral ones 8 to 14 lines long, one bent down only 6 to 8 lines long. Flowers 2 to 2.5 inches long, 2 inches in diameter; setose spines of tube 3 to 6 or T lines long; petals deep crimson, 6 to 7 lines wide; filaments and anthers red. In specimens from Santa Fe, collected by Mr. Fendler, the flowers are near 3 inches long, the petals 8 to 9 lines wide, and the setae on the tube are spinous, with brownish points. Echinocereus viridiflorus, n. sp. ovato-globusus, humilis, sub-13-costatus; areolis lanceolatis, approximatis, junioribus villosis; aculeis 16-1S rectis, radiantibus, lateralibus iongioribus fuscis, reliquis albidis, centrali nullo s. elongato robusto, apice fusco; floribus lateralibus; tubo pulvillis 25-30 albo-tomentosis setas albas 5-10 gerentibus stipato; sepalis interioribus lineari-oblongis sub-10; petalis 12-15 lineari-oblongis, obtusis; baccis ellipticis virescentibus, seminibus parvis tuberculatis. Prairies on Wolf creek, flowers in June; Santa Fe, flowers in May, (Fendler.) Body 1 to 1.5 inch high, oval; spines 1 or 1.5 to 3 lines long; central spine when present 6 to 7 lines long; flower 1 inch long and wide, outside green brown, inside yellowish green; petals only 2 lines wide, being about 5 lines long.